Frances Osborn Robb, a scholar who has worked on the Encyclopedia of Alabama, writes in to correct some information we included with an image of Confederate president Jefferson Davis‘s inauguration. 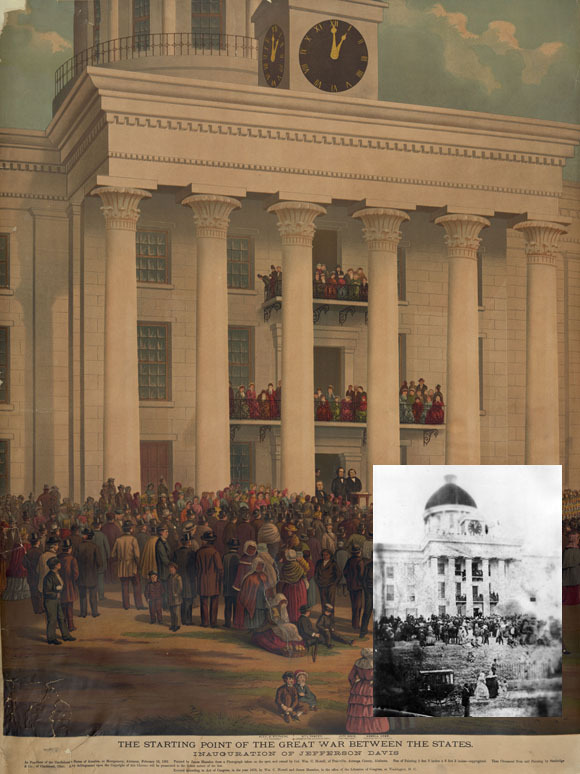 I read the short information on the color lithograph of Davis’s inauguration. I presently have a book manuscript under review by the University of Alabama Press on the history of photography in Alabama, and I would like to correct the authorship of the original image. The lithograph is based on a painting by James Massalon made for William C. Howell of Prattville, Alabama. The photographer is not credited, but he was Archibald Crossland McIntyre of Montgomery, who advertised his view and three others on Feb. 19, the day after the event in the Montgomery Messenger. The best surviving print of his photograph is in the Boston Athenaeum. Another is in a family collection in New Hampshire. A copy of the photograph, now in the Alabama Department of Archives and History, was deposited there by the photographer’s niece Toccoa Cozart. McIntyre was not credited with the authorship of this image until 1912, when Dudley H. Miles published the earliest known half-tone of the photograph in the Illustrated History of the Civil War, crediting McIntyre with the original. Best of luck with the Encyclopedia of Virginia. My husband and I have written several articles for our new Encyclopedia of Alabama, and it seems to be a hit! Thanks for the information, Frances. Above is the lithograph, with one of the original photographs (courtesy of the Encyclopedia of Alabama) inset. Trying to identify the people on the capital portico with Jeff Davis. There is disagreement among some people in Alabama about this. Lithograph shows 4 men. Davis, Stephens, Yancey, Cobb. Where is best attainable image? ps- Just returned from 150th reinactment in Montgomery. The best photograph is one of McIntyre’s originals. It is in the Boston Athenaeum. Sorry, I don’t look at this web site often, and until a friend told me about your query, I literally did not know about it. I am not sure that any of the individuals shown with Davis were intended to be recognized nor, indeed, were recognizable in any version of the finished prints. Try looking at a scan of the original photograph against photographs of his companions and see what you think.